If you had a brain tumor, would you go to your family doctor to get treated? Of course not, you would ﬁnd a specialist! The same is true for your brokerage needs. You need a specialist; someone who devotes their time to ﬁnding the best space for your needs with the best terms and conditions. Hiring a tenant rep who has your objectives in mind will help you achieve your leasing goals faster. Here’s a few more reasons why…. An unrepresented tenant is a landlord and listing broker’s dream come true! In exchange for saving a small percentage in lieu of a broker’s fee, unrepresented tenants typically pay 10 to 20 percent higher in occupancy costs. It might seem easier to work directly with the landlord or landlord’s representative, but remember: they are both ethically and legally bound to take care of the landlord’s interests at your expense. 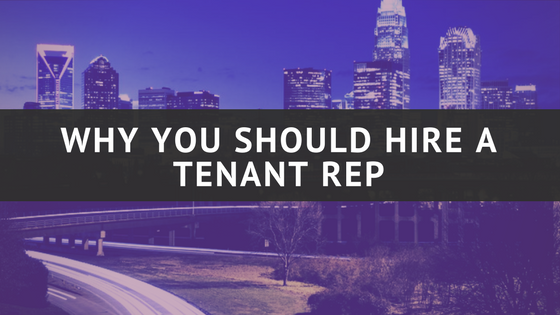 Your tenant rep has one job—to get you the best possible space at the best possible terms. A Landlord Rep working for you is at a conﬂict of interest. They have the listing and their ﬁduciary duty is with the Landlord. They are looking out for their best interests, not yours. Typically, landlords have built in commission for brokerage. If you aren’t represented, the budgeted commission fee goes to the broker negotiating on the landlord’s behalf— in other words, you are paying someone to work against you. A Tenants Rep job is to understand your business and ensure your location is in line with your overall strategy. From budgeting, cost, visibility, trafﬁc counts, etc., a tenant rep can keep you on track and stay within the scope of your business plan. A good Tenant Rep will streamline the acquisition process to be efﬁcient and effective for the tenant. The internet has created a world of “real estate experts”; however, many of the best spaces get snatched up before ever becoming publicly available. It is a tenant rep’s job to know about these spaces—and get you into them! If a landlord knows you are represented by a Tenant Rep Broker, they will be more aggressive in the pursuit of your tenancy. Brokers also have existing relatinoships with landlords to utilize to your advantage. Your tenant rep will do more than help you identify good spaces. They will tell you about developments and growth patterns that can affect your business in the future, let you know how other businesses in the area are performing, and reveal the economics particular in the trade area. A broker has access to data and tools such as demographics, trafﬁc counts, sales ﬁgures, and comparable leases. Tenant representatives make a career out of long and complicated real estate negotiations. They handle the paperwork, identifying LOI/Lease provisions that could potentially cost or harm you, making sure that that you fully understand what you are signing. They will ensure that you are protected in the lease and walk away with nothing left on the table. In addition, they will maximize the amount of the landlord’s contribution towards renovations, and negotiate additional savings such as free rent. Your broker is your one point of contact, simplifying the process for you. They can act as the “bad guy” when necessary, keeping your relationship with the landlord cordial. Lawyers, contractors, civil engineers, architectures, etc. Allowing a broker to do their job alleviates stress and frees up your time this leaves you with more time to do what you are best at—developing and running your business! Consider hiring a tenant rep broker TODAY with The Chambers Group for the best client service in the industry. To learn more about The Chambers Group, the leading retail brokerage in the Carolinas, click here.